Green Bean Curry is a delicious combination of fresh vegetables, herbs and spices, and coconut milk. It’s easy to make in under 30 minutes. And it’s naturally vegan, gluten-free, and oil-free. Thank you to my friends at Minute® Ready to Serve for sponsoring this recipe. There are so many different varieties of curries from all over the globe. You can find curry on the menu in countries such as Thailand, India, England, Jamaica, and Japan. While they each have their unique flavors, there is one thing they have in common: they all taste great with grains such as brown rice and quinoa. But sometimes it seems like it takes longer to cook the grains than it does to make the curry. And this can be a problem when I want curry in a hurry! 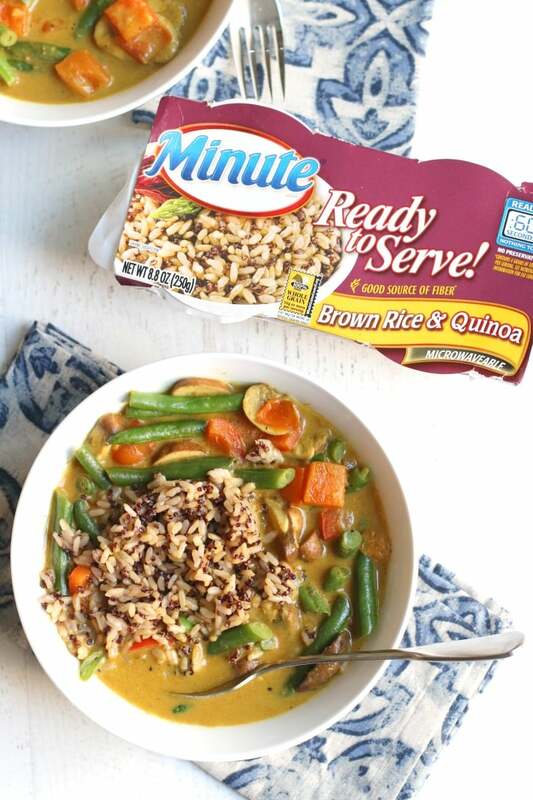 That’s why I’m glad that I learned about Minute® Ready to Serve. In just 60 seconds you can have a perfectly cooked single serving of rice to go with your meal. It’s perfect for bringing to work or school. And it also makes for a wholesome snack which you can eat straight out of the cup. All you need is a microwave! Two individual servings come in each package. The cups and film are BPA-free, plus the rice is gluten-free and free from preservatives. 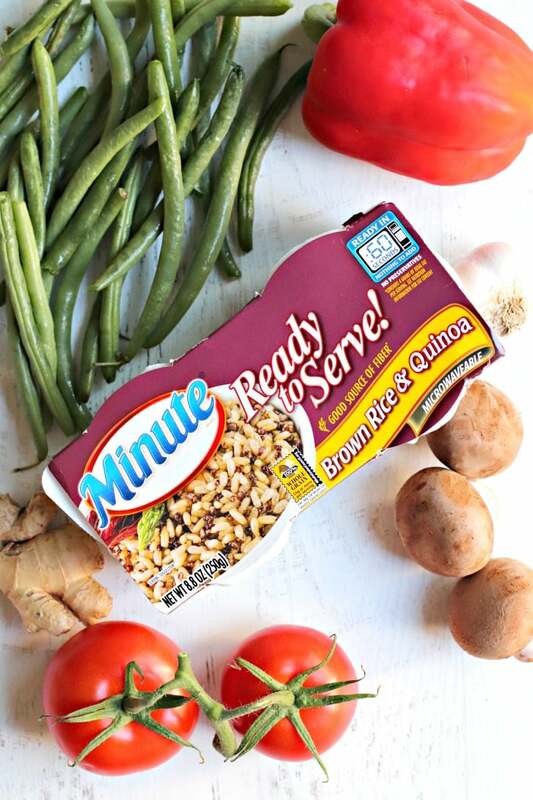 I really like Minute Ready to Serve Brown Rice & Quinoa because I enjoy the textures of these whole grains together. The red quinoa is slightly crunchy, and the brown rice has a nice chewiness. The unique nutty flavor compliments so many dishes. It’s a delicious way to get 55 grams of whole grains into your diet, which is more than the recommended 48 grams per day. Fiber and complex carbohydrates never tasted so good! 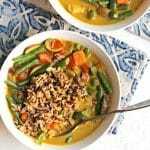 Green Bean Curry is easy to make with your favorite vegetables. I used mushrooms, red bell pepper, and tomatoes in addition to the green beans, but you can use your favorites or whatever vegetables you have on hand. The key to this flavorful dish are the spices. I start with fresh garlic and ginger, which are staples in my house. Then I add some spices from my pantry. You probably keep cumin and turmeric on hand. And for this recipe you’ll want to pick up a spice blend called Garam Masala. It’s an aromatic combination of coriander, cardamom, cinnamon, cloves, and other spices. Not only is it delicious in this curry, you’ll also find yourself adding it to other recipes once you try it. To make Green Bean Curry, you start by quickly sauteing the garlic and ginger. Then you add the spices and give them a stir. Next the vegetables go in the skillet, along with the coconut milk. Everything simmers until the vegetables are soft, which doesn’t take long at all. Then you’re ready to eat! 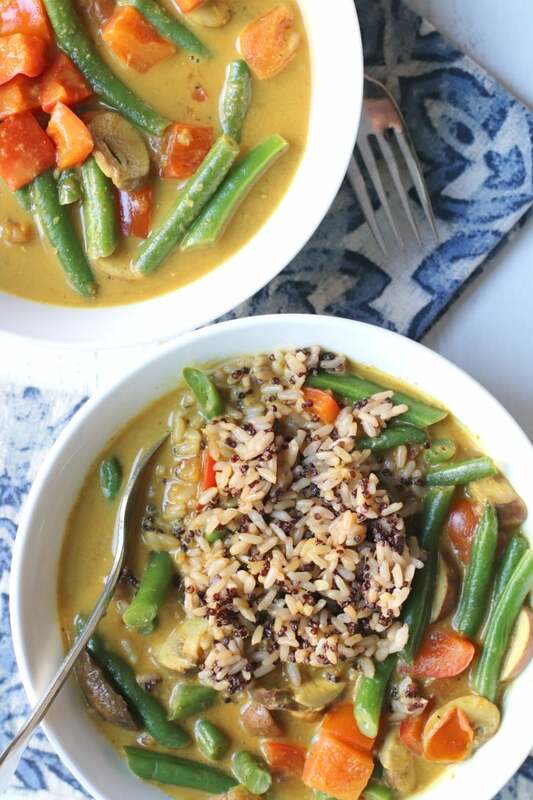 Be sure to check out the quick video to see how easy it is to make Green Bean Curry! Now let’s make Green Bean Curry! Green Bean Curry is a delicious mixture of fresh vegetables, herbs and spices, and coconut milk. It's easy to make in under 30 minutes. And it's naturally vegan, gluten-free, and oil-free. Heat about 2 Tablespoons water in a skillet over medium heat. Add the cumin, turmeric, and Garam Masala and give the mixture a good stir. Then add the green beans, mushrooms, red bell pepper, and tomatoes to the skillet. Pour in the coconut milk and stir to combine. Simmer uncovered until the vegetables have softened, stirring occasionally, about 10 to 15 minutes. Season to taste with salt and pepper, and serve with heated Minute® Ready to Serve Brown Rice & Quinoa. This looks so good! I literally just made a quick Thai curry and served it over Minute Brown Rice. We use Minute Rice all the time, but I’ve never tried these. Love the brown rice/quinoa combo! Great minds! 😉 These cups are new. They have a few other varieties I’m looking forward to trying. I love how quick and easy this is! Curry is one of my favorite things to eat. Your curry looks so good and I love that the rice and quinoa are combined in the pots. It adds extra nutrition and texture. Perfect! Thanks Mel! 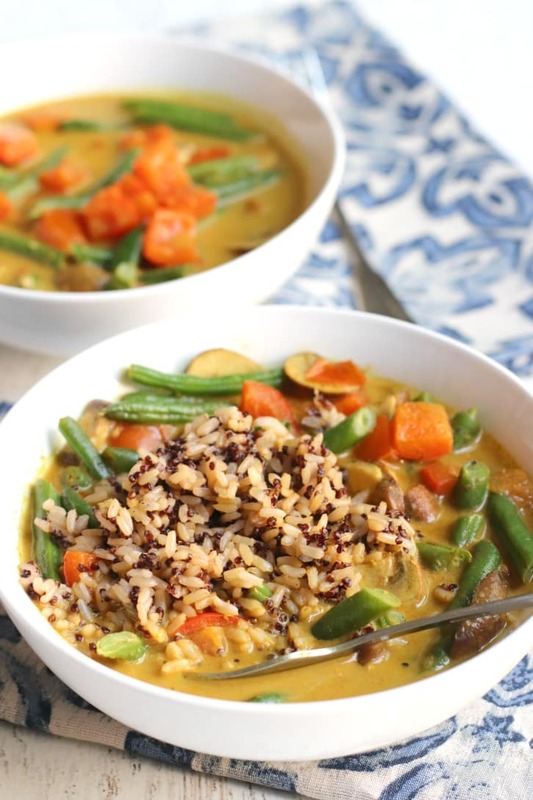 I love this curry, and the brown rice and quinoa together are really delicious. my favorite – a vibrant bowl of veggies and rice and flavor! this looks amazing. This looks like such a delicious weeknight dinner! Love how quickly it comes together with that microwave rice!!! Thanks Sarah! I love curry!